In small saucepan, simmer water and palm sugar until dissolved. Add tamarind and fish sauce, and stir to combine. Add Sriracha to taste (about 2 Tbsp). Set aside. Fill large bowl with warm water and let noodles soak approximately 15 minutes. Heat 1 Tbsp oil in large non-stick pan over medium heat. Fry tofu until golden on all sides, set aside. Saute meat and set aside (if using). Wipe pan clean, add more oil if needed. Scramble eggs, set aside. Wipe pan clean. Heat 1 Tbsp. oil over med-high heat. Saute shallot and salted radish 2-3 minutes. Add drained noodles and combine. Pour in about ½ of the Pad Thai sauce and stir constantly to coat noodles thoroughly. Stir fry about 5 minutes, add more sauce if it starts to dry out too much. Add green onions, tofu, cooked meat, and eggs. Combine well for about 3-5 minutes, add more sauce if needed. Turn off heat, add bean sprouts, peanuts, and cilantro. Squeeze ½ of lime and serve. 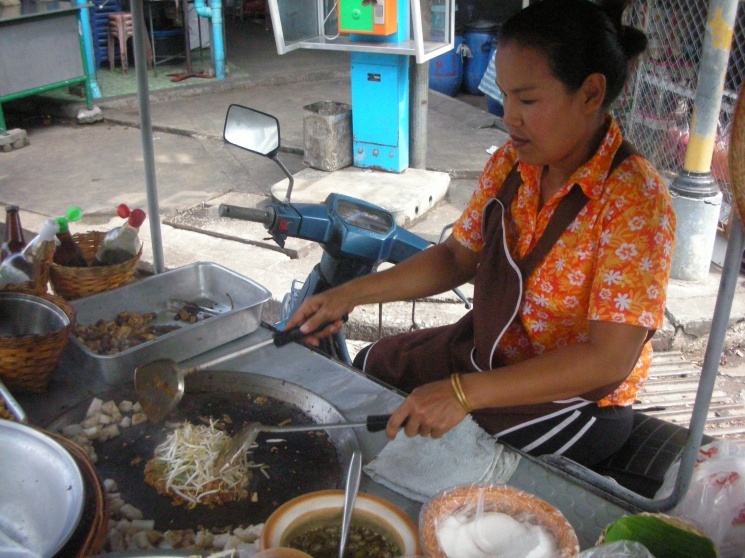 Team Thai-Juan, representing Thailand and Mexico, took home Best Dish honors with this simple Thai street food staple. Basically, we wrapped some ground chicken and pork around lemongrass spears, threw em on the grill, and slapped on some peanut sauce before serving. Fire! Grind first 7 ingredients in processor to coarse paste. Do not clean processor. Heat oil in medium skillet over medium heat. Add paste to skillet; Saute paste about 5 minutes; transfer to large bowl and cool. Add chicken and salt to processor; grind coarsely. Add ground chicken and pork into paste in bowl. Clean lemongrass by removing outer layer(s), wash and remove the tips. 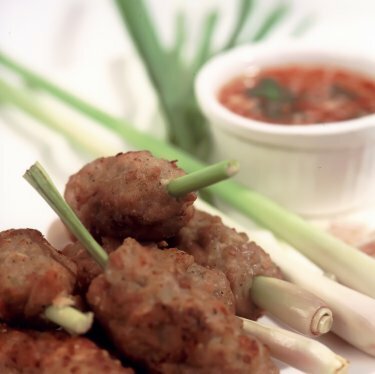 Press ¼ cupful of meat mixture around thick portion of 1 lemongrass stalk in 4-inch-long sausage shape, leaving 1 inch of stalk end exposed. Repeat with remaining chicken mixture and stalks. Prepare barbecue (medium-high heat). Grill until chicken is cooked through, turning often, about 8 minutes. Serve with warm peanut sauce.